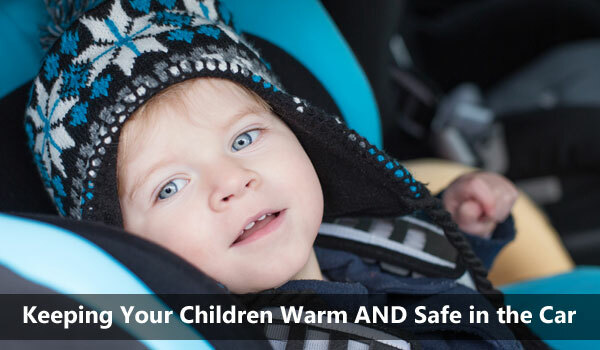 Winter is the time of year that even some of the most devout car seat safety advocates unknowingly put their children in danger. When it gets cold enough for jackets, I know it is tempting to keep your little one as warm as possible in that cute, puffy coat with the faux fur lining. While those are perfect for romping around in the snow (or just cold and wet, for those of you in south Texas with me), leaving them on a child strapped in a car seat is dangerous and can be deadly. When you are going to and from the car, you can have your child put their jacket on backwards. This makes it easy for you to slip it off, get them buckled in, and get it back on again in a short amount of time. Having them wear thermals or warming the car up ahead of time is a good idea if it is especially cold out. The poncho style jacket is easily lifted for buckling straps and it drapes over the back of the seat so there is no extra padding between your child’s back and the car seat. If your little one is still in an infant bucket seat, they have covers similar to the poncho that keep the cold air out and don’t interfere with the safety of the seat. They are both now sold in quite a few children’s stores and there are also patterns to make your own if you are crafty! A hybrid of a regular jacket and a poncho, a special “car seat friendly” jacket has two zippers that run up the side hem and down the arm on each side. You can also take a jacket you currently own and transform it with two zippers, a needle, and thread. The placement of the zippers allows you to lift the back of the jacket and slide the child’s arms out of the sleeves easily when they are in the car seat, and then transforms into a regular jacket when you zip them up after you get to your destination. Micro-fleece is very thin but still warm. In some places it is enough on its own and in the colder places it can be paired with a blanket or one of the options above for extra warmth. Some fleece jackets, however, are still too thick to be safely used in a car seat. Unbuckle your child without adjusting the straps and put the jacket on. Try to buckle your child into the seat without adjusting the straps. If you have to adjust the straps at all, the jacket is too thick to be worn the regular way in a car seat. If you can buckle them in without adjusting you are good to go! I am a working crunchy mom of one boy, Calvin, who was born on Pi Day 2013. I am a technical writer in Austin, Texas.